(A side note: as I was sitting in the airport waiting for my flight from Newark to San Francisco, I looked up and saw a familiar face – Judy Russell from The Legal Genealogist! We shared the next two flights, although Judy was furiously dealing with an unfortunate hack attack on her website, which has since been resolved). The day began with Spencer Wells, an Explorer-in-Residence at the National Geographic Society and the lead for the National Genographic Project. Dr. Wells discussed the history of the Genographic Project, including its launch in 2005 with the original Y-DNA and mtDNA tests, and the three-prong nature of project (research, public participation, and grants). He then discussed the project’s recently launched Geno 2.0 test (see here to purchase). I’ve heard Dr. Wells speak several times now, and each time he has been engaging; this time was no different. If you ever get the opportunity, you will not be disappointed! I attended Tim’s talk, which was very good. Chromosome mapping – essentially mapping every segment of your DNA to an ancestor – is a challenging and lifelong endeavor. The benefits, however, are numerous and I recommend that everyone try some mapping as they explore autosomal DNA testing. Next up was Dr. Gates – “Skip” – with a discussion of his family, how he got started in genealogy and genetics, and the development of his many PBS series. It was a fascinating insight into Dr. Gates’ family history as well as the African American experience in general. It was, without a doubt, one of the most interesting talks I’ve ever heard. At one point he mentioned that his father was the funniest man he ever knew, but it’s clear that much of that humor was inherited by Dr. Gates! At two or three points during his talk I literally laughed out loud, something I never do at lectures like this! He received a standing ovation at the end of his talk; indeed, the crowd practically jumped to their feet. One half of the terrific audience! In a cruel, cruel twist of fate, my talk began immediately after Dr. Gates’ talk. I began the talk with a comment to that effect, and I think that was sufficient to break the ice! I spoke about “Using Third-Party Tools to Analyze Your DNA Results,” the first time I’ve given this talk. I think it went very well; the 200-member room was mostly full and it was both live-streamed and recorded for purchase and the SCGS member archive. I’m hoping the reviews provide some useful feedback! I attended CeCe’s talk, which was a great look at some real-life case studies and examples from her own research providing insight into the MANY uses of autosomal DNA. I attended Ken Chahine’s talk to learn more about AncestryDNA’s most recent developments, and learned that he is an engaging and energetic speaker. I have to admit I was interested by the factoids about the MRCA hits! The most common decade for MRCA hits is 1690-1700 (what generation, on average, would that work out to?) with the vast majority of hits between 1650 and 1820. The most common locations for MRCA were Virginia, North Carolina, Pennsylvania, and Maryland, followed by a long list of other states and countries. I wonder, is Ancestry.com attempting to correlate this type of information about the MRCA with information such as segment size or other characteristics (maybe properties of the shared trees, locations of the segments, etc)? This could potentially be used to provide clues to the matches. I can envision something like this hint: “Since your tree and the tree of your match have significant Colonial America branches, and based on the amount of shared DNA, we recommend that you look for a match in the timeframe of 1680 to 1700, which is when approximately 85% of similar matches have identified their MRCA.” There’s (potentially) a lot of potential. The talk was followed by a brief Q&A, during which several of the questioners were extremely rude. It was embarrassing, and I hope the Ancestry.com team members do not consider this conduct to represent the genetic genealogy community in any way! Aside from the terrific speakers, the highlight of this trip for me was seeing friends both old and new, and simply being surrounded by people interested in genetic genealogy. Although it’s likely that more than 1,000,000 people have had their DNA tested for genealogically-relevant information, we are still a close-knit community. 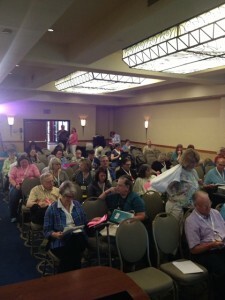 Thank you to the Southern California Genealogy Society for inviting me to DNA Day. It was well worth the long plane ride ahead of me! Thanks for sharing your experiences of DNA Day. I enjoyed watching the livestreams from the comfort of my own home on the other side of the Atlantic. I’m a bit alarmed that Ancestry is giving timeframes for the dates where their customers are finding the common ancestors. I suspect that many of these common ancestors are genealogical ancestors rather than genetic ancestors. As Ancestry do not provide the matching segment data the matches cannot be verified without uploading the raw data to third party services which is something that few people do. I suspect that few Ancestry subscribers will have traced all their lines back to the 1600s or 1700s so that they can say for sure that the common ancestor they have identified with their match is the only one who could possibly have contributed their DNA. Watching the DNA panel I missed an answer I was curious about: what did the AncestryDNA rep say about the possibility of accepting 23andme imports in the future? I’m very curious about the “extremely rude” questioners for Dr. Chahaine. There are many ways to be rude. What did these people do? Did they mock their ethnicity estimates? Did they insult Dr. Chahaine? Did they insult Ancestry.com? Did they sneer at the lack of a chromosome browser? Were they dismissive of Ancestry’s attempts to get better? Did they chortle at their attempts to match trees to simulate matching DNA? Did they denigrate Ancestry in comparison to other sites? I’m probably giving the jerks more credit than they deserve by asking about it, but since I wasn’t there and didn’t see the stream, I want to be a better person by not doing what those yokels did. Thanks for your help. That’s great. I am eagerly looking ahead. It is really excited to know that “85% of similarity matches have identified”. Thanks a lot for sharing, God bless you.